These photographs show views of the Cheney Drug Company store in Cheney, Kansas. 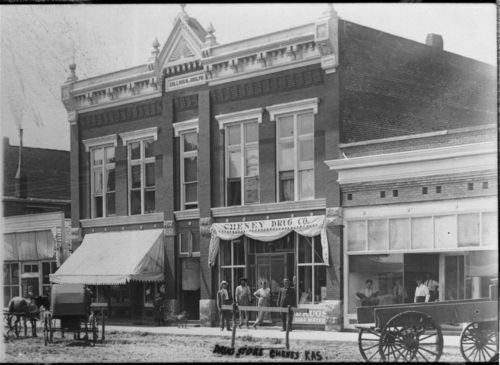 The first photograph shows an exterior view of the Cheney Drug Company located in the Collins and Joslyn Building. Four men are visible standing in front of the store, and a sign below the windows advertises drugs and soda water. The offices above the drug store are identified as those of Dr. Artman, M. D., and the telephone office. The business to the left of the drug store is identified as Robert King Jewelry Store. Four men are visible near the front of the store on the right side of the picture, and a girl and a dog are visible in front of the store to the left of Cheney Drug Company. A horse-drawn buggy and a wagon are visible in the street. The second photograph shows an interior view of the Cheney Drug Company store. A man and woman are visible standing in the store. Many display cases are visible along both sides of the store, and shelves line the left, back, and right walls. The shelves on the left appear to be filled with bottles of chemicals and pharmacy supplies. A partially visible sign across the top of the back shelves reads, "To cure a cold in one day." The hanging sign near the middle of the picture reads, "Wise men smoke Ben-Hur cigars," and advertises the five cent price. A wall clock is visible on the left side of the back wall. Holding Institution: Floyd Sanders, 1960.